Cards and bonus colouring book for building friendships and preventing bullying. Making friends comes absolutely naturally to many children. But even young children may find forming friendships a highly complex business, overlaid with social rules and expectations imposed by adults and their peer group. Mates Traits is a set of 32 colourful, light-hearted cards that describe some of the characteristics of real friendship. Using a delightful cartoon cast of Australian birds and animals, Mates Traits attempts to unlock the strengths, attributes and understandings that go into friendship-making. What are the strengths needed to make friendships work? What does real friendship look like? How do friends manage when they have disagreements or things don’t go according to plan? Mates Traits can be used by people of all ages to open up conversations about relationships, social skills, communication, personalities and interests. It is also a unique resource for preventing bullying and overcoming the effects of bullying on children’s social confidence. Select cards to help explore the difference between being friendly and being a friend. Pick 3 cards that describe what some of your friends/you/your team do well. Is there a card that suggests something you’d like to improve? Pick a card that illustrates a difficult experience you have had in a friendship (e.g. ‘We have our moments’). Were you able to move forward together or did the friendship dissolve? What did you learn? Invite everyone present at a celebration to select a card they think matches the guest of honour. This resource is designed for anyone concerned with the role that friendships play in the maintenance of good mental health and social well-being. It is also a must for the toolkits of primary teachers, chaplains and social welfare coordinators. The right question at the right time can be transformative. The right question can create space for hope, uplift a community and change a person’s outlook for life. Felicity Rorke knows better than most just how powerful questions can be. Last year she travelled to South Sudan to provide training to young women on behalf of Mercy Beyond Borders. Delivered as part of a leadership course designed to support girls’ education, the training had a particular focus on the thorny issue of gender-based violence. In South Sudan, as in other countries around the world, war has had a significant impact on women’s well-being and advancement, but so too have cultural attitudes in a region where men and women alike struggle to access education. Felicity began by encouraging the girls to think about their female friendships and support networks before the conversation shifted to boyfriends and husbands. Adding the complexity of the exercise, there were at least three different ethnic groups represented among the forty young women present. Aware that some of the girls were being excluded because they represented the ethnic minority, Felicity moved to break up the cliques by numbering them off to form new groups. Although the experience proved challenging for some of them, the Mates Traits cards helped the girls stay focused on the key messages of supporting one another and valuing friendships. Kristen Tinkler has been travelling to PNG regularly for the past six years, visiting her brother and trekking into remote areas each time. She is keen to pursue volunteer work there and support local communities dealing with high unemployment, low literacy levels, and limited health and education services. Kristen works at Melbourne’s Holmesglen Institute where she is involved in the Work Education Program and teaches students aged 17-21 who have learning difficulties. Next year she will spend her long service leave back in Rakanda, assisting children with disabilities and supporting language and literacy work at a local school. Most of us have at least one friend. Some of us have many friends. But how often do we stop and wonder what makes a good friendship? It can be easy to take friendships for granted and not wonder about the chemistry that makes them work. 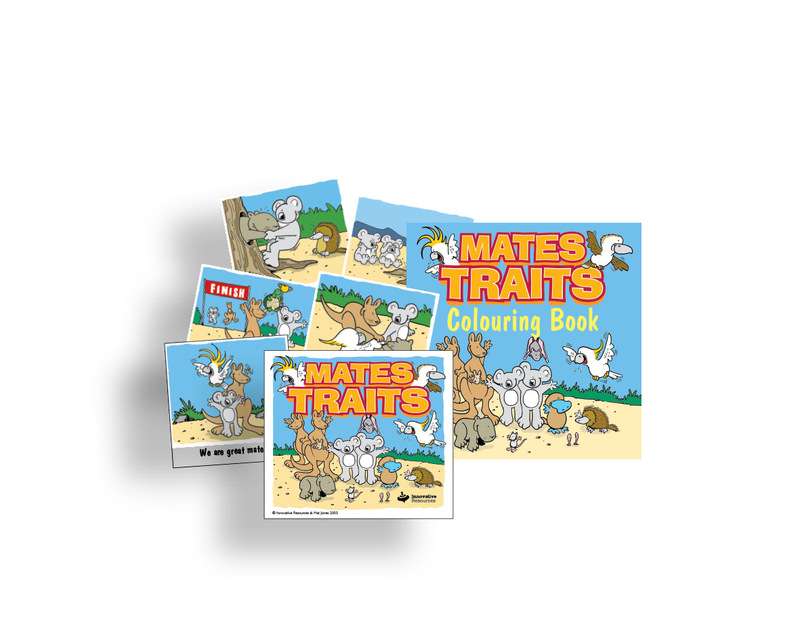 Mates Traits, produced by Bendigo’s own ‘seriously optimistic’ publishing house, St Luke’s Innovative Resources, unlocks the complexities of friendship-making using delightful cartoon characters of Australian birds and animals created by local artist Mat Jones. Like all of Innovative Resources’ materials, this set of 32 full-colour, laminated cards has no set rules or instructions, but a myriad of uses. As a tool for parents, Mates Traits can help to build conversations about safe friendships and the characteristics of a healthy family. 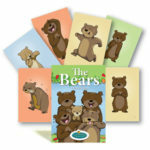 For teachers and school counsellors, the cards are a fun way to develop cooperative learning environments and tackle problems such as bullying and self-harm. In a human services setting, Mates Traits covers a wide territory; from family and foster care situations to youth work and pastoral care. Mates Traits also comes as a set of stickers or a 64 page colouring and activity book. The stickers provide a wonderful opportunity for giving a simple gift that says something positive about others, while the colouring book is an enjoyable way to get across positive, pro-social messages and create conversations with children as young as pre-school age. 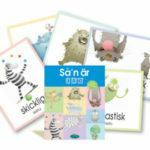 And kids will want to interact with these cards. Mat Jones’s illustrations are irresistibly vibrant and funny. Combined with simple, yet powerful, statements they form a resource that will remind children and ‘big kids’ alike about the value of true friendship.